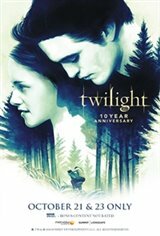 Fathom Events and Lionsgate are bringing Twilight 10th Anniversary to select cinemas nationwide for a special two-day event including an introduction by director Catherine Hardwicke and fans will receive a commemorative poster! Bella Swan (Kristen Stewart) doesn't expect much when she moves to the small town of Forks, Washington, until she meets the mysterious and handsome Edward Cullen (Robert Pattinson) - a boy who's hiding a dark secret: he's a vampire. As their worlds and hearts collide, Edward must battle the bloodlust raging inside him as well as a coterie of undead that would make Bella their prey.